There are many items that are considered fool-proof that were probably made for people like me, who are fools. Items like the easy tear part on a resealable bag of cheese (oh yes, I have cut that whole deal off before), the sharp side of aluminum foil boxes with brightly colored text saying "TEAR HERE" (I usually try to tear it on the soft, flexible, cardboard only side), and jar lids (I can never open them, and end up crying on the floor of the kitchen as my pasta boils and boils and boils). Then, of course, are the plastic rings that hold together 6 packs of soda (or pop, in my home state of Michigan). I almost always am able to vanquish their hold on my desired drink, but about 60% of the time, I end up punching myself with a full can of soda in the process. Not on Wednesday, oh no. On Wednesday, a can just dropped out of the 6 pack while I was carrying it around, making the fallen can's top all fucked up. I am assuming it's because this product is (awesomely) still made in America, and therefore the cans are all non-uniform and made out of inferior aluminum, but I can't prove that. I am a generous soul. I feel bad for things that are deformed, like maybe they'll have no friends. 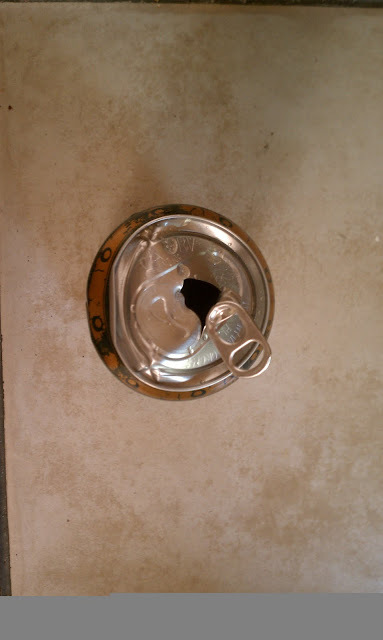 I imagined my fucked up can in the fridge with all the "normal" cans, and I thought it would probably have a hard and terrible life in there. I didn't want it to feel like it was being chosen last because of its abnormality, so I chose it FIRST. Now, the second foolproof item in this story, which is really about how the universe doesn't want me to be hydrated, is the easy-open tabs. You know the ones; they're on all beverage cans. They are hearty. They work really well. They make that satisfying noise when you press them into the pre-punctured area of the top of the can, which is pleasantly shaped for ease of drinking. Not for me. 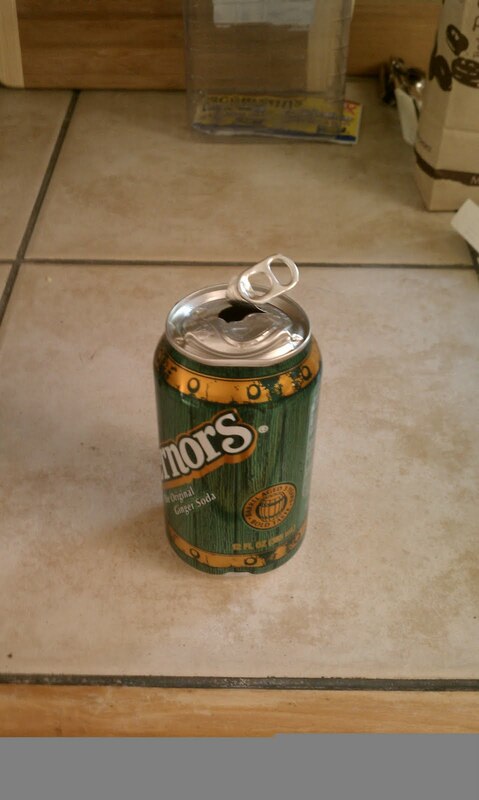 I bent it forward, it almost fell off, and only made a tiny hole in the top of the can. I thought it would be enough for me to get my delicious ginger ale into my glass, but I was wrong. All that came out was a few drops of foam. I decided to battle on. I was NOT going to let this stupid mutant can defeat me. No, I would rip its head off if I had to. In the end, I prevailed, and ended up with a can that looked like it had been exposed to some kind of radiation as a baby pod can, and then been forced through a war. Oh, the taste of victory is sweet, sweet like ginger ale. It's coming for you with its razor sharp edges! If you turn your head, you can see that it was scowling at me, even in its clear defeat.